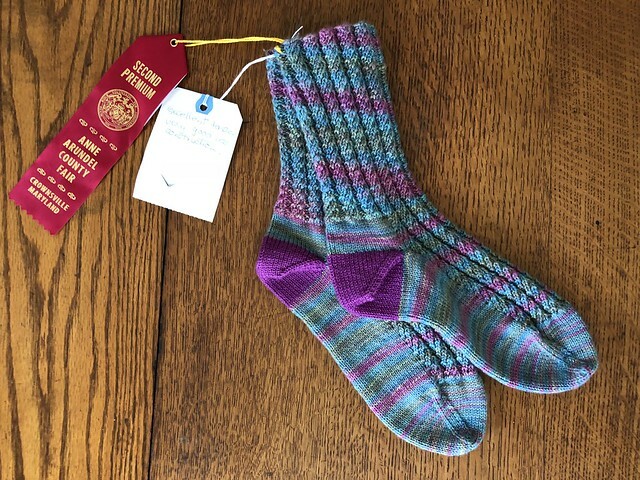 My open-toed shoes and sandals are put away for winter now, so I thought it would be timely to write about socks this week. 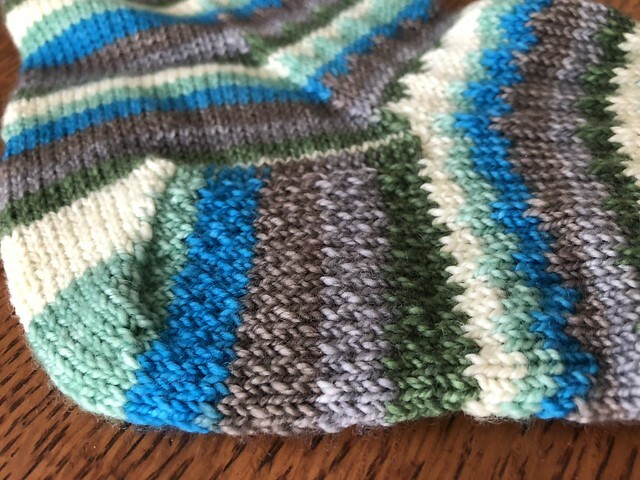 Today’s post will be knitting a pair of Geek Socks and a pair of Nine-to-Five Socks, then Thursday’s post will focus on Knitting Socks with an Afterthought Heel or Contrasting Heel. Ultimately, you want durability and resilience in a sock yarn and resulting socks. Wild Rumpus (Blue/Grey): For this pair of socks, Marseille used Canon Hand Dyes, colorway ‘Let the Wild Rumpus Start!’. They dye colorways inspired by literature, so the book is different now but the colors are always fun. Their Etsy shop has the latest. Swirly Girly (Blue/Plum): Marseille chose two colorways, one for the main sock and one for the heel. The main sock was knit in Cherry Tree Hill Yarn Supersock Merino (Blue) while the heel was done in Cherry Tree Hill Yarn Supersock Solids (Red-purple). 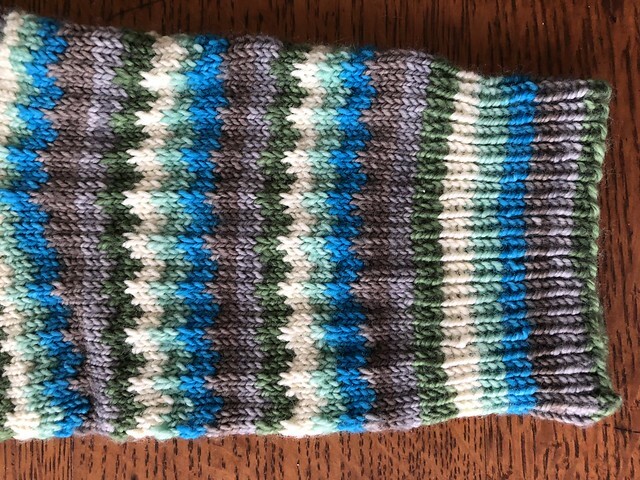 Wild Rumpus (Blue/Grey): Geek Socks by Wei S. Leong is a fun and textured approach to knitting with self-striping sock yarn. Instead of plain stockinette, Ms. Leong developed this slipped stitch pattern. It was featured in the Spring + Summer 2015 issue of Knitty. With such a fun approach, I’m surprised there are fewer than 800 projects on Ravelry. In the pattern, Ms. Leong details how the yarn looks in stockinette alongside her pattern. It’s a great demonstration of how the pattern adds a new dimension to yarn. Swirly Girly (Blue/Plum): The Nine-to-Five Socks by Nicole Hindes were featured in All Buttoned Up and have grown in popularity. It is a free Ravelry download with over 1,500 projects. That’s a lot of warm, cosy feet! Marseille chose the 72-stitch size for this pair. It is an ideal size and fits a ladies size 9 (7UK) foot. The pattern itself includes a special right-twist stitch, which Ms. Hindes details in this video and her blog post. There’s no shortage of sock patterns in this world, so you can choose the one that speaks to you and works best with your chosen yarn. 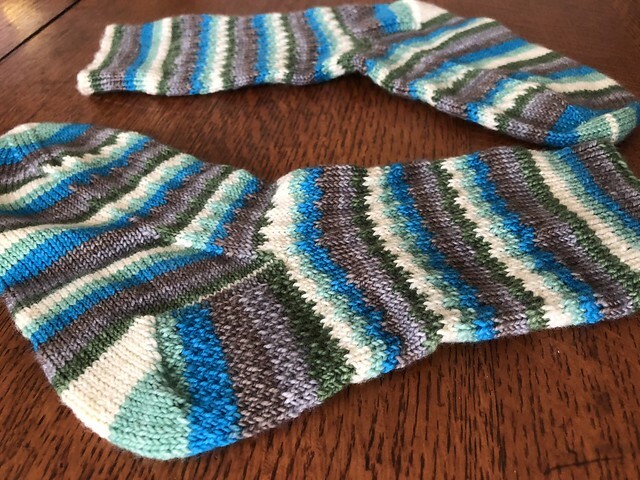 Here’s an EvinOK post with a list of some lovely sock patterns. Wild Rumpus (Blue/Grey): The ripples in the blue pair are such fun and really perfect for the color way. The fit is excellent with a good resilience in the yarn, which is ideal for socks. The edge is stretchy but not slouchy. The texture behind the heel really adds to the durability of well worn socks. Swirly Girly (Blue/Plum): The result was cheerful and swirly with the colors really coming through with the stitchwork. The cuffs are lovely and stretchy. Don’t you just LOVE the contrasting heel (more about that on Thursday). They’re beautiful, right? And award-winning! 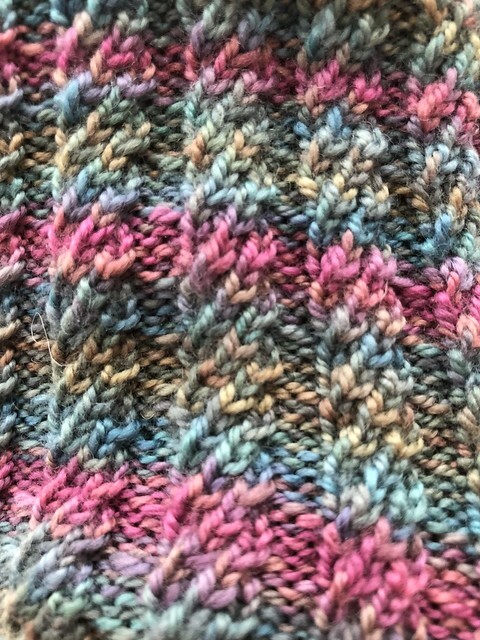 Here is a close-up of the right-twist stitch pattern. I admire Marseille’s avid sock knitting so much! 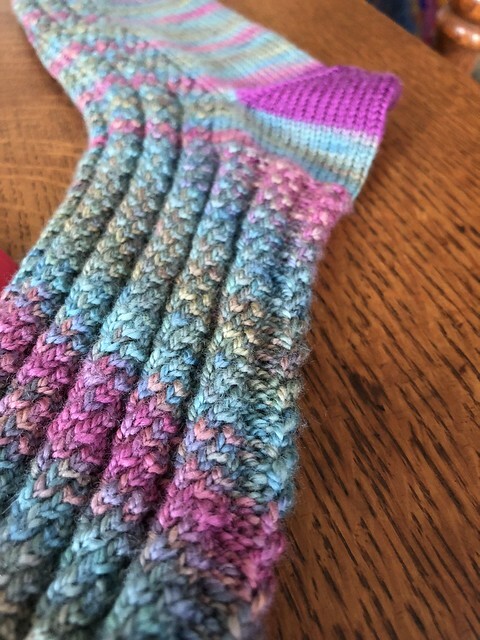 One day I’ll be brave enough to knit a pair of socks myself, but until then I can admire her work.Come back on Thursday for another sock knitting post – Knitting Socks with an Afterthought Heel or Contrasting Heel! Take that, Autumn weather!!!! This entry was posted in Knit Socks & Boot Cuffs and tagged Marseille. Have just started trying to make adult socks so this is a lovely read. Thank you for sharing all the links to some super socks. Brilliant. Can’t wait to see how you get on with sock knitting. I’ve yet to try it myself actually. I just admire Marseille’s socks! Lucy, I love perfect timing like this! There’s another sock-focused post today! Oh thank you Evin. I’ll definitely be taking a look! Thanks, Diane! Socks are all the same and yet so much room to customize and make colorways stand out. These two designs are really sweet and Marseille’s knitting skills made them shine.